Watford Ladies have confirmed squad numbers ahead of the start of the 2017-18 FA Women's Super League 2 season. England U19 international Rinsola Babajide will suit up with the number eleven shirt, while Adekite Fatuga-Dada will play with the number 34 kit. Babajide is well known in these parts for scoring fourteen goals in the second half as University of East London women's football team demolished University College London 40-0 in a British Universities Cup game. The 19-year-old joined Watford in February 2017 and represented the club in the FA WSL Spring Series. Former Arsenal striker Adekite Fatuga-Dada extended her contract with the Golden Girls in February and has featured for the U17 team of England. 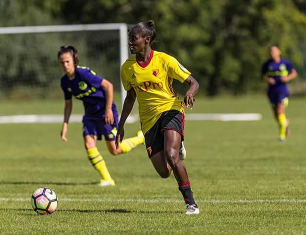 Watford Ladies begin their campaign against Babajide's former club Millwall Lionesses at the St Paul’s Sports Ground (London) on Sunday, September 24.